Multiscale directional statistics are investigated in two-dimensional incompressible turbulence. It is shown that the short-time behavior of the mean angle of directional change of fluid particles is linearly dependent on the time lag and that no inertial range behavior is observed in the directional change associated with the enstrophy-cascade range. In simulations of the inverse-cascade range, the directional change shows a power law behavior at inertial range time scales. By comparing the directional change in space-periodic and wall-bounded flow, it is shown that the probability density function of the directional change at long times carries the signature of the confinement. The geometrical origin of this effect is validated by Monte Carlo simulations. 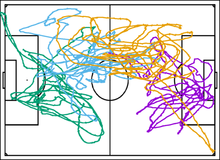 The same effect is also observed in the directional statistics computed from the trajectories of football players (soccer players in American English).